“In April ’10 I celebrated my first complete year of blogging here on WordPress. It’s fascinating to be able to look back at posts I wrote one year ago and compare them to what I’m writing now, to see how I’ve changed as a person reflected in how my blog has changed over the past 15 months. Yeah. I don’t know what I’m writing about here– me, or GACKT, I don’t know yet. 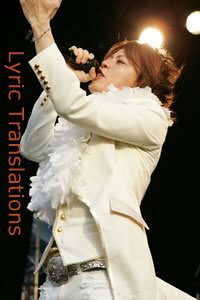 I don’t even bother separating them out anymore, somehow whenever I talk about anything to do with myself personally it comes back to GACKT in some way or another. Back when I was younger, before GACKT or Jrock or Visual Kei– or even before anything to do with Japan–, I had this clear idea of who I was and what I was going to be (I wanted to be a novelist); it was like I had this big highway stretching out in front of me and I never even considered turning onto an exit ramp. There was never even any need for me to think about it, because I just knew. A lot of people ask me how I became interested in Japan, and the answer is, the music. When they ask me how I started listening to the music, though, I don’t have an answer. It was as though suddenly one day I was listening to this streaming online radio called kawaii-radio, where I heard Vanilla, and then somehow GACKT’s The Sixth Day came into my hands. And when that happened, it was a complete flip of the above mentioned situation. The highway didn’t matter anymore and all there was was an exit ramp, and I was taking it at 180MPH.